Range: Small, isolated populations mostly in sub-Saharan Africa. They are very rare in southern Algeria and northern Niger, and range from Senegal east to Somalia and south to northern South Africa. Habitat: Savannas, both open and more densely vegetated. These places give cheetahs the open areas they need for quick stalks and chases. They are not found in forest areas or wetlands. Cheetahs stalk their prey, approaching to within about 50 feet before dashing out from cover and sprinting at the targeted animals. They grab their victims’ throats and suffocate their quarry within a few minutes. They have long legs and a long, flexible spine built for explosive acceleration and high speed. The cheetah’s stride, or the length from when one paw leaves the ground until that paw again touches the ground, is about 25 – 30 feet. A sprinting cheetah can reach 45 miles per hour within 2.5 seconds. Top speed—up of up to 64 miles per hour—can only be briefly sustained. They must catch their breath before dragging their prey to cover. Then they must eat quickly before they lose the kills to other bigger or more aggressive carnivores. Female cheetahs live alone, except when raising cubs. Males live in small permanent groups called coalitions, which are usually made up of two to four brothers. Unlike other big cats, cheetahs cannot roar, but they can purr when they inhale and exhale like domestic cats. Cheetahs eat primarily hoofed mammals weighing less than 90 pounds including gazelles and young wildebeest. They will also eat smaller game such as hares, warthogs, and birds. The length of a cheetah ranges from 3 1/2 to 4 1/2 feet long, not including the 30-inch tail. They weigh between 75 and 145 pounds and stand two to three feet tall at the shoulder. Males tend to be a bit more robust and weigh about ten pounds more than females. The cheetahs conservation status is listed as vulnerable and they’re on the Red List of Threatened Animals. Once widespread across arid Africa, Middle East, and east to India, the cheetah has suffered dramatic declines over the last century. Their biggest threat is habitat loss due to human encroachment. Widespread habitat destruction has fragmented the cheetah’s habitats, isolating many populations. They are also hunted for their spotted coats and because they sometimes attack livestock. The cheetah’s prey has also been overhunted by people. They suffer from genetic defects due to inbreeding, possibly the result of a population bottleneck (a sharp decline) that occurred as far back as 10,000 years ago. 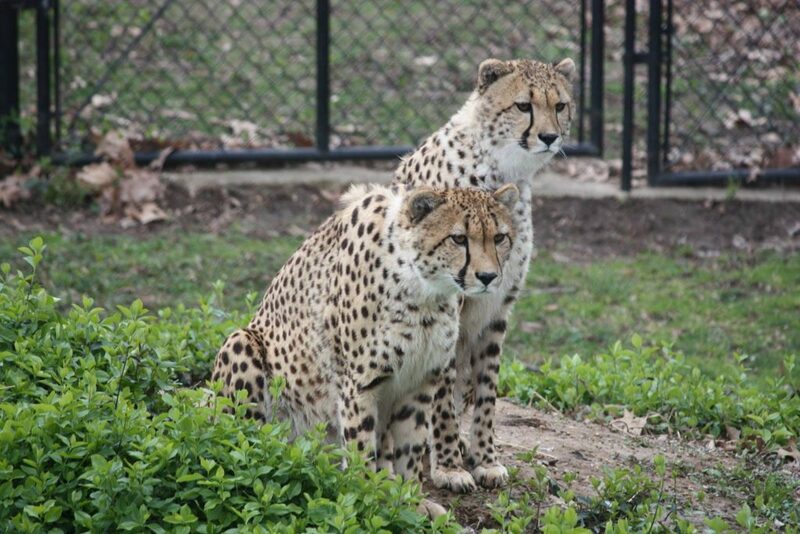 Scovill Zoo supports cheetah conservation in South Africa. At Scovill Zoo we have two brothers named Kapenda (meaning small & brave) and Segosi (meaning regal) born at the Smithsonian Conservation Biology Institute in Virginia in November 2013. We also have Jafari (which means dignified) who was born at the De Wildt Cheetah and Wildlife Center in South Africa on March 22, 2002.